Newton was the first Professor of Zoology and Comparative Anatomy at the University of Cambridge. He bequeathed books of outstanding historical importance, especially for ornithology in 1907. Up to 1913 these books were attached to the Museum of Zoology, after which they were transferred to a room adjoining the Balfour Library. Note that all books bequeathed before 1882 were given in the first instance to the former Museum of Zoology Library (established 1870) and were transferred to the Balfour & Newton Libraries in 1938/39 leaving only small working collections in the Museum and The Insect Room. The Balfour & Newton Libraries own a collection of Alfred Newton Papers, which includes manuscript materials such as correspondence (including that between Newton and Charles Darwin and many other eminent scientists), as well as photographs, prints, printed papers and pamphlets. This collection was transferred to the Department of Manuscripts & University Archives at Cambridge University Library in 1989. A catalogue of the material in this collection is available to download here. Please note that at the end of the Alfred Newton Papers catalogue document there is a brief list of material that has not yet been fully catalogued; it may be that we have more details of this material than is described in the catalogue so please contact the Senior Library Assistant if you have any queries. Otherwise you will need to contact the Department of Manuscripts & University Archives at Cambridge University Library directly to make an appointment to consult the material there. Please see http://www.lib.cam.ac.uk/deptserv/manuscripts/ for contact details if you would like to arrange this. The partial card index to the correspondence has been transferred with the papers. Other Alfred Newton archives are catalogued on Janus http://janus.lib.cam.ac.uk/, a catalogue of archives held throughout Cambridge (do a keyword search for Alfred Newton). 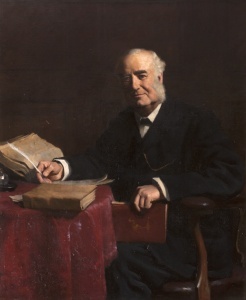 Some are also catalogued on the National Register of Archives http://www.nationalarchives.gov.uk/nra/default.asp (do a Person Search for Alfred Newton). The Archives hub http://archiveshub.ac.uk/ also catalogues Newton archives held at Cambridge University Library and the Cambridge University Museum of Zoology. See also the Darwin Correspondence Project at http://www.darwinproject.ac.uk/ for the full text of the correspondence between Charles Darwin and Alfred Newton. Professor Tim R. Birkhead and Peter T. Gallivan, from the University of Sheffield, UK, have published the paper Alfred Newton's contribution to ornithology: a conservative quest for facts rather than grand theories. Ibis (2012), 154, 887-905. The paper discusses Newton's life and collections. Newton had much to do with the establishment of zoology as a scientific discipline. His library is an incredibly complete assemblage of ornithological literature up to the time of his death. It contains many rare and unusual items and the books tend to be special copies in one way and another. His collection of offprints was extensive and the Department consequently has a very large collection of these (as above). These have been disposed of from many libraries in recent years and intact 19th century collections are becoming rare. As a collection they have much to tell about the spread of scientific information. The collection includes the third known copy of Darwin’s Questions About the Breeding of Animals; his first publication, Letters on Geology; the Darwin-Wallace paper which announced their theory of evolution, and Mendel's Versuche über Pflanzen-hybriden, the foundation paper of genetics. See The Complete Work of Charles Darwin Online at http://darwin-online.org.uk/ for the full text of Darwin's publications.